You can’t just take a saw to a tree. There are safety precautions that you must take into account, as well as proper planning and prepping. If you do it wrong, you could damage your tree and surrounding property. If you just need pruning or cutting, look to My Backyard Landscape Enhancements to do the job right. We approach this task with the utmost care and respect. All too often, we have seen harmful pruning, fertilization and mulching practices that can be detrimental or deadly to a tree. 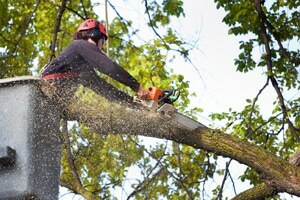 Trust us for a quality tree cutting service Peoria IL needs. 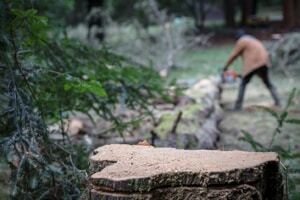 My Backyard Landscape Enhancements comprises Certified Tree Workers and Certified Arborists. In addition, we are proud members of Illinois Green Industry Association, TCIA and the BBB. Our goal is to offer our customers safety, quality, knowledge and dependability. We are committed to the health of all trees, as well as your home’s safety and the latest approved tree care practices. Not sure if you should cut down your tree? Sometimes, you have no choice because the tree is dead, diseased or a safety hazard. Thus, here are some signs that your tree should be cut down. Is the tree dead? Sometimes this can’t be answered on sight alone. It may just be dormant. Have a professional come out to inspect it. Is there fungus growing at the base of the tree? Moss is natural on trees, but lichen (a blend of moss and fungi) can slow down the growth of your tree. Finally, are there roots showing along the ground? Trees that start growing along the surface can signal it is having difficulty managing the land around it. Shallow root systems make the tree more susceptible to harm from animals, humans and weather. In conclusion, to learn more about our tree cutting service in Peoria IL, please contact us at 309-657-0571. We serve all of Peoria, East Peoria, Peoria Heights, Chillicothe, Dunlap and surrounding areas.